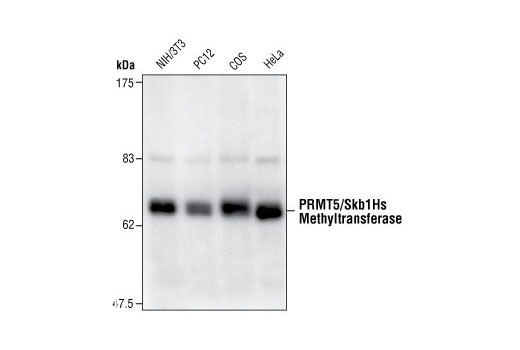 Western blot analysis of extracts from various cell types using PRMT5/Skb1Hs Methyltransferase Antibody. PRMT5/Skb1Hs Methyltransferase Antibody detects endogenous levels of total Skb1Hs methyltransferase protein. The antibody does not cross-react with other related mammalian methyltransferases. Polyclonal antibodies are produced by immunizing animals with a synthetic peptide corresponding to residues surrounding amino acid 100 of human Skb1Hs methyltransferase. Antibodies are purified by protein A and peptide affinity chromatography. Human Skb1Hs methyltransferase (also called JBP1), a homologue of yeast protein Skb1 and Hsl7p (1,2), is composed of 637 amino acid residues and contains motifs conserved among protein methyltransferases. It methylates histones and MBP in vitro (2). Yeast Hsl7p is involved in regulation of cell cycle progression through G2 by negatively regulating Swe1p, a protein tyrosine kinase that phosphorylates and inhibits Cdc28p (3). An Hsl7p homologue, Skb1, was identified in fission yeast by virtue of its yeast two-hybrid interaction with Shk1p, a p21 (cdc42p/Rac) activated kinase (PAK) (4). Both proteins belong to the protein methyltransferase superfamily (5). Interestingly, human Skb1Hs methyltransferase was shown to interact with Jak kinases. This suggests the possibility that the Skb1Hs methyltransferase could link Jak to a PAK signaling pathway in mammalian cells. Gilbreth, M. et al. (1998) Proc. Natl. Acad. Sci. USA 95, 14781-14786. Pollack, B.P. et al. (1999) J Biol Chem 274, 31531-42. Ma, X.J. et al. (1996) Genes Dev. 10, 1327-1340. Gilbreth, M. et al. (1996) Proc. Natl. Acad. Sci. USA 93, 13802-13807. Ma, X.J. et al. (2000) Trends Biochem. Sci. 25, 11-12.